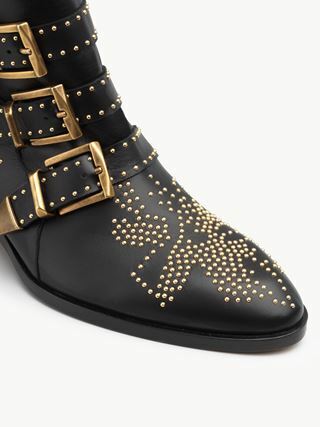 Chloé girls get in touch with their feminine glam-rock side with this higher leg version of the emblematic Susanna boot. With its trio of buckled straps and elongated cowboy toe shape, the Susanna has a cool Western feel and a sharp, yet feminine, silhouette. 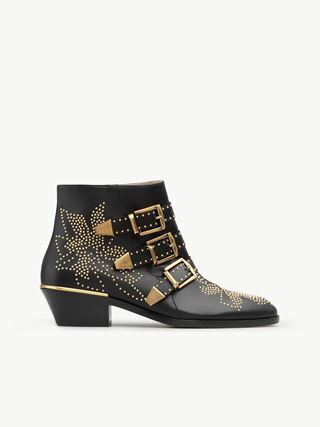 Vintage metal pieces and golden studs in the Maison’s own emblematic floral pattern pair with a strong Cuban heel and thick masculine sole.